Before I tell you about this delicious cornbread it is appropriate that I say this bread is food for the stomach. There is another Bread that sustains real life, and that is Christ, the true Bread from Heaven. You can read what Jesus said when he called himself the Bread of life in the Bible – John chapter 6. In these three dimensions however, there is no bread, nowhere, to compare with this delicious old fashioned soda bread. It contains no flour and no sugar. I make it almost every day and it is soon devoured by me and my husband Jack and the dog Bruno, if he’s lucky. Several years ago Jack bought an old gristmill, nearly a hundred years old. 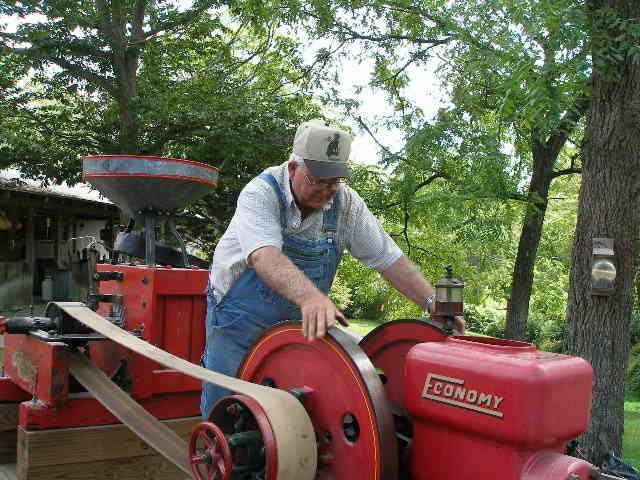 Lacking a waterfall of suitable size to power his gristmill, he bought an old hit and miss gasoline motor of the same vintage and soon he was grinding corn. Recently he bought wheat and now we have whole wheat flour. Whole wheat is good, I guess, if you have time and patience to make yeast bread. 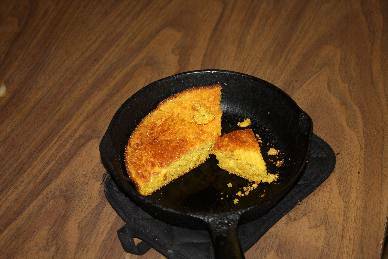 But…why bother, when corn bread tastes simply divine and cooks up in a minute. Grease a small cast iron pan and place in oven. I use an 8 inch pan. Heat to to 400 – 450. While oven is heating measure a little over a cup of coarse ground corn meal and sift it into a bowl. Throw away whatever does not go through the sifter, and don’t push it or bread will be over-crunchy Add a half teaspoon of salt and a quarter teaspoon of soda and mix in. Add one egg and some oil or bacon grease, a tablespoon or two. Do not mix at this point. When the pan is hot add about a cup of buttermilk and mix everything up quickly. Take pan from oven and pour excess melted grease that is in pan into the batter and mix in. Pour the batter into the pan and return pan quickly to oven. In a few minutes you will have a cake of the best cornbread on the planet. Do not substitute sweet milk for buttermilk. The chemical reaction between the sour buttermilk and the soda is what causes the bread to rise. This recipe is based on a recipe I found on the internet. Unfortunately I can no longer find it to give credit to my source. I do remember that the lady who posted it said her mother (or perhaps her grandmother) made this bread every day for her family. I can certainly see why. I am certain it was much in demand.